Our Improv Troupe Show program is digital! All Thunder Theatre Company meetings are on Mondays in room A174 at 3:30! The Thunder Theatre Company is Desert Vista High School's student-run Theatre Program. You are officially invited to check us out! Meghan Perales, Mantra Rostami, and Serena Kahn in Thunder Theatre Company's production of "Parlor Games". 17 April 2018. Lucas Rooney acting in Thunder Theatre Company's production of "Parlor Games". 17 April 2018. The Thunder Theatre Company is a student-led club at Desert Vista High School based out of Phoenix, Arizona. TTC is primarily organized by a council of students as well as a director and sponsor. As a council, we prioritize the enjoyment and education of our members. We aim to produce at least two major shows a year, one straight play and one musical. TTC also holds several fundraisers and blackbox shows. Since TTC’s separation from Thunder Speech and Debate in 2014, the company has progressed to include even more chapters, shows, and members. From the amazing Improv Troupe to the newly founded Tech Troupe, we have something for everybody’s individual interests. With an impressive repertoire, including recent musicals and plays like How to $ucceed, Parlor Games, The Addams Family, Dracula, and Sweeney Todd, TTC has proven itself to be a dynamic and talented group of kids. TTC is always welcoming to new members and any support. If you are a student and are interested in our company, feel free to check our announcement page and attend our next meeting! If you are a parent looking to support your child and our club you can check out our TTC Boosters page and contact them for further information. Here at Thunder Theatre Company, we are always excited to see new faces! We are super excited for the 2018-2019 school year and the amazing things that are to come! Samantha Maxwell, as Morticia Addams, and the ensemble during TTC's production of The Addams Family, 2017. Alex Silver and McKenzi Kelly at The Western Murder Mystery Dinner, 2017. Jack Walton, Sebastian Williams, Natalie Hale, and Kiersten Mason behind the scenes. Jack Walton and the ensemble perform in The Addams Family, 2017. Kristen Kibby and Will Lombardi at the Thespian Leadership Camp, 2018. Nora Baier and Maritza Kozicki perform the song "Cinderella, Darling" in Act Two of TTC'S production of "How to Succeed in Business Without Really Trying", 2017. 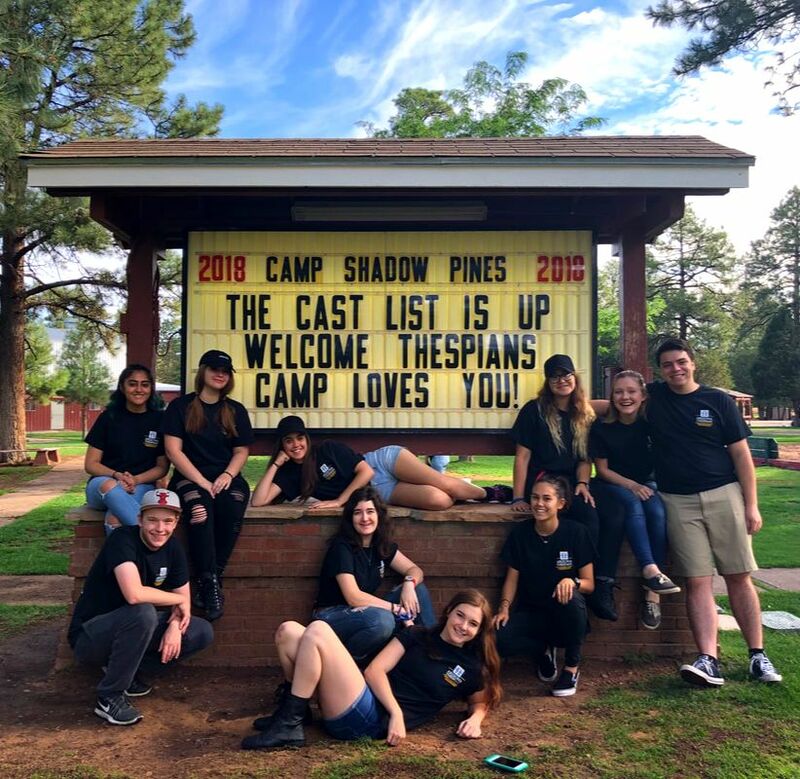 Maritza Kozicki, Nicole Rossi, Lauren Mooney, Jack Walton, Will Lombardi, Kristen Kibby, Natalie Hale, Danielle Hale, Kiersten Mason, and Mantra Rostami, attend Thespian Leadership Camp in the July of 2018. Kiersten Mason, Danielle Hale, Maritza Kozicki, Natalie Hale, and Will Lombardi attend the annual Induction Ceremony, 2018. How to Succeed in Business Without Really Trying, 2017. The Western Murder Mystery Dinner, 2017.